Asia’s largest high definition LED display in one of Hong Kong’s busiest commercial districts has been transformed into a public art installation to mark the beginning of this year’s Arts Month. ‘Artificial Landscape’, presented by SOGO and independent new media art outfit Videotage, is being shown on a 1,400 square metre 8K ultra high definition LED screen on the facade of Sogo shopping centre in Causeway Bay. A video artwork shows for three minutes on the hour from 6pm to 10pm every day, with a new video every five days. 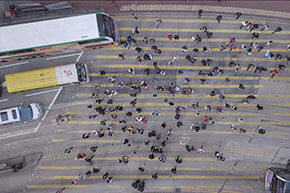 One of the videos, O, takes drone footage of the familiar busy crossing outside Sogo and tracks the movements of the pedestrians, connecting them with dots and lines that almost appears to be happening in real time. “It’s not like audiences have to go to the museum or the gallery, this is naturally embedded in our environment and in the cityscape,” says curator Isaac Leung from Videotage. ‘Artificial Landscape’ features digital works by four young artists – Carla Chan, Chilai Howard, Lawrence Lek and Shi Zheng – that present various approaches to the ideas of artificiality and landscapes, and challenge the way viewers think about their environment. “It is an experiment on how video arts could engage with people’s everyday life and how people would rethink their relationship with architecture and screens apart from watching TV commercials one after another,” Leung says. The annual Hong Kong Arts Month includes exhibitions, dance, music, theatre and more. And the city’s biggest art fair, Art Basel, will open by the end of this month with inspiring programmes by local and overseas artists. Another group exhibition showcasing Hong Kong artists is “Exit Strategies”, a site-specific project that uses the public space in the ground floor and staircases of H Queen’s in Central to explore concepts of psychological escapism in response to the hustle and bustle of this city. Mediums ranging from installation, video, sculpture, photography and sound, provided varying examples of psychological withdrawal, negation and delusion as forms of escapism from the frenzy of everyday lives in the city, according to H Queen’s, a building dedicated to art galleries. “Through “Exit Strategies”, I hope to lay the groundwork for the public to reflect upon their drifting lives in a tactile and immersive environment,” says David Chan Ho-yeung, who conceived the show that features works by established and emerging local artists, including Chloë Cheuk, Silas Fong, Lee Kit, Linda Lai & the Floating Projects Collective, Map Office, Tsang Kin-wah and Tamás Waliczky. Audiences can engage in a transitory environment and experience phenomena of collapse, inversion, compression and delusion as they descend from the 17th floor to the ground floor. Artificial Landscape will run until March 31, while Exit Strategies will continue until late March and April.